Patrick spent his formative years moving around the country because his father was in the US Air Force. By the time he was 18 he had traveled through 49 states and accumulated 22 different addresses. After completing his high school diploma from Tolleson Union High School Patrick pursued a career in music and went to ASU for music performance. Patrick Switched majors 6 times and schools twice and ended up with bachelor’s degrees in History and Psychology with a minor in music from Ottawa University. He was the first in his family to complete a college education. While pursuing his education Patrick worked a variety of jobs including personal security, education paraprofessional, and skip tracer. Patrick received his Masters in Educational Technology from Northern Arizona University in 2010. As an educator he has taught in public, private, charter, and at the Community College Level. 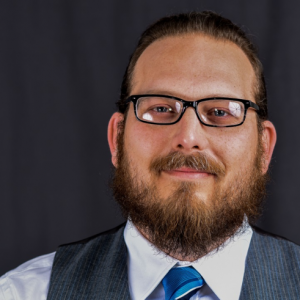 Before coming back to e-institute in 2016 Patrick worked at the Department of Education as a Professional Learning Specialist. Patrick has worked with e-Institute for 4 years as both a teacher and administrator. e-Institute is a public charter school in Buckeye, AZ that helps high school students catch up on credits or jump ahead on their education. Available both online and in a traditional classroom setting, our classes give you a whole new learning experience. Our curriculum includes required high school courses and a wide selection of electives. Count on us to bring you a step closer to earning your high school diploma. If you didn’t graduate high school on time and want to go back to school now, or you need to keep a full-time job while studying, e-Institute is the right place for you, too. Our self-paced setting and flexible schedule make it convenient for you to complete your high school education. We have two to four-hour sessions spread across five days in a week; select those that suit your schedule. Our academic courses are in line with the Arizona State Standards. We provide you with the latest in educational assessment, guided practice, and remedial studies. We also have experienced teachers who are passionate about offering an excellent alternative opportunity for high school completion. Enroll at e-Institute today, and expect to have a charter high school education in Buckeye that prepares you for a prosperous future. 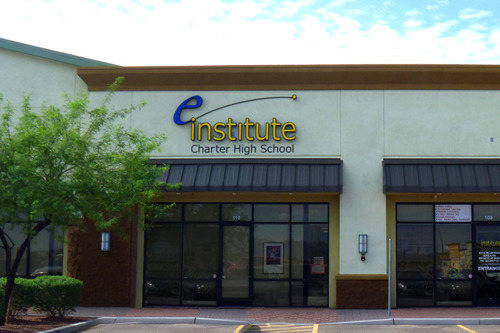 e-Institute is one of the leading charter high schools in Buckeye. We offer a selection of courses, a flexible schedule, and a convenient learning platform. Whether you want to make up for the courses you missed, earn extra credits to speed up your graduation date, or go back to high school while keeping a full-time job, count on us to help you.